Looking for a fun summer recipe? 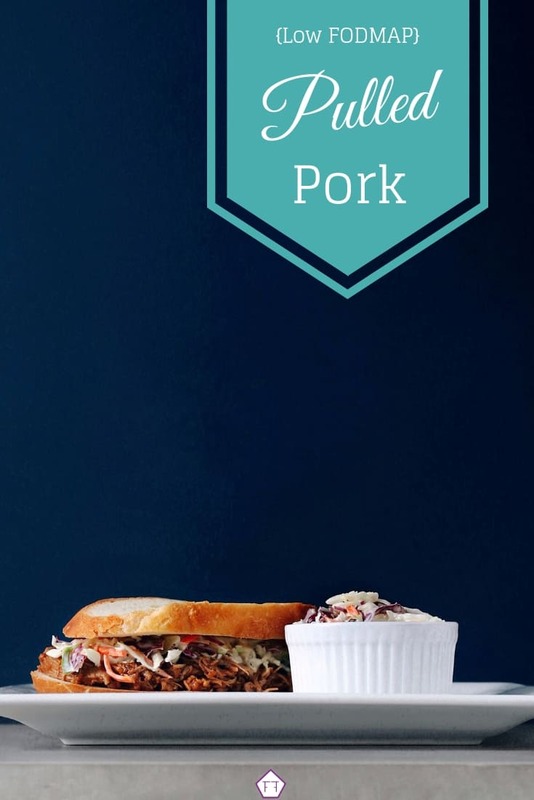 This low FODMAP pulled pork is perfect for your next FODMAP friendly backyard BBQ or picnic. Covered in a homemade FODMAP friendly BBQ sauce, this pulled pork will be a summer show stopper. This recipe is so easy it will make your next summer bash an absolute breeze. Just pop it in your slow cooker and walk away. 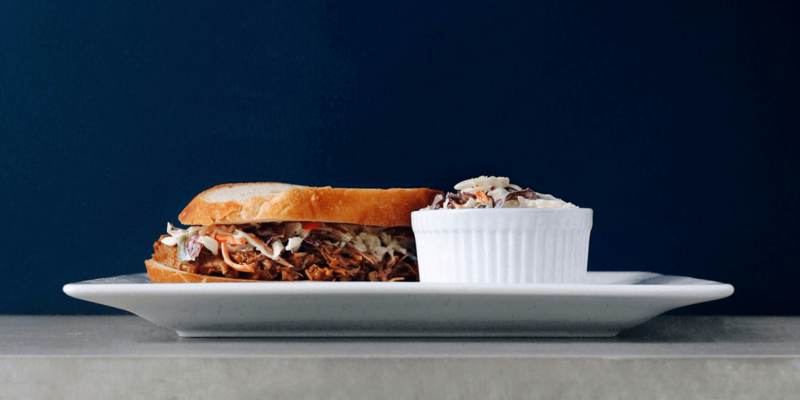 You’ll come back to deliciously seasoned pulled pork, perfect for sandwiches, poutine, or savoury tacos. Remember to make your BBQ sauce at least two hours before the pork is finished. The flavours need a few hours to commingle before they’re ready to shine. Think this low FODMAP pulled pork sounds great, but you don’t have time to try it now? You can PIN THIS POST for later. This low FODMAP pulled pork will be a family favourite in no time. Check out the notes below for tips on keeping this recipe low FODMAP. First, since pork is a protein, it doesn’t contain any FODMAPs. 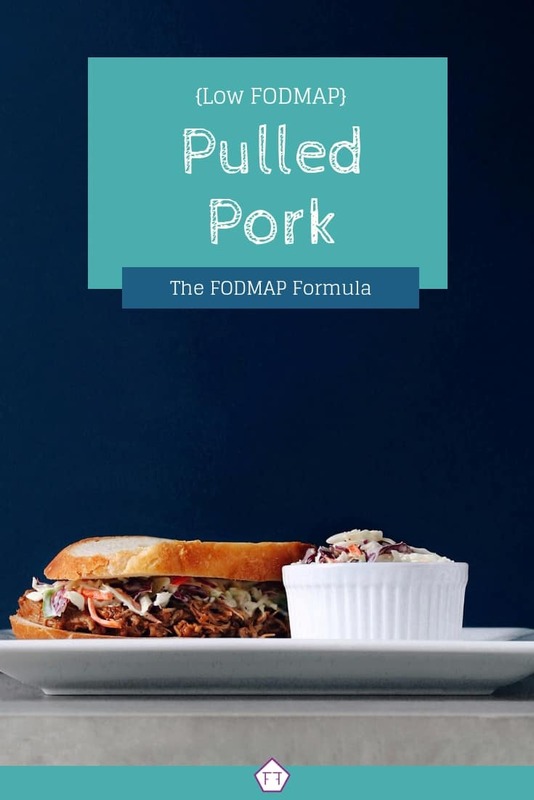 This means you can have as much pork as you want without contributing to your FODMAP load. However, some people also react to fat. If you think you’re sensitive to high-fat foods, you can either trim the excess fat off of your pork shoulder or use a pork tenderloin instead. This recipe also uses root beer. Make sure to check the ingredients for glucose-fructose, high fructose corn syrup (HFCS), or artificial sweeteners ending in -ol. I’ve found some great cane sugar root beers in larger chain grocery stores and farmer’s markets. Finally, if you’re in the elimination phase of the diet, you’ll need to find a low FODMAP bun. You can either use a gluten-free bun or my personal favourite: sourdough bread. Not every gluten-free product is FODMAP friendly, so make sure to check gluten-free products for sneaky FODMAPs. If you want more low FODMAP bread options, check out this article by Monash University. Remember, unless you have celiac disease, you’re avoiding the FODMAP fructan, not gluten itself. We will also be using my FODMAP friendly BBQ sauce. Make sure to check out my Low FODMAP BBQ Rib post for tips on keeping this BBQ sauce FODMAP friendly. This dish is pretty flexible, so you can change up your sides depending on what you have on hand. I like to pair this dish with fresh veggie sticks, homemade coleslaw, or plain white rice. My husband is a huge fan of rice. He likes to use it to mop up his BBQ sauce which I’ll admit is delicious. 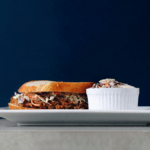 Want to try this low FODMAP pulled pork? Don’t forget to PIN THIS RECIPE for later. Looking for a FODMAP friendly recipe summer recipe? 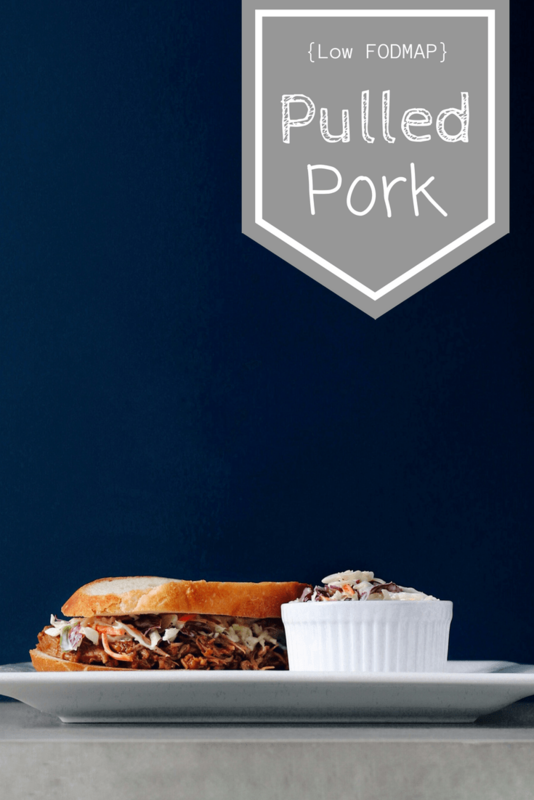 Try this delicious low FODMAP pulled pork. This easy recipe will be a summer show-stopper. Trim your pork shoulder and place it in your slow cooker. Pour the root beer over the meat, stick the lid on, and cook on low for 6-7 hours. Place a medium-sized saucepan over low heat and add the ingredients one at a time. Stir after each addition to blend the flavours together. Once all of the ingredients have been added, switch to high heat and whisk the sauce until it boils. Then remove the sauce from heat and let it cool. If you're using molasses for this recipe, your BBQ sauce will need about 2-4 hours to reach the proper flavour. If you're using cane sugar syrup, it will take 8-24 hours to reach full flavour. Once your meat has cooked, remove the pork shoulder from the slow cooker and place it in a large bowl. Remove any bones and shred the meat using two forks. Mix in your BBQ sauce and serve with bread or rice. This low FODMAP pulled pork will be the talk of your next backyard BBQ. If you like this recipe, sign up for my mailing list below. You’ll get new recipes and articles delivered right to your inbox.